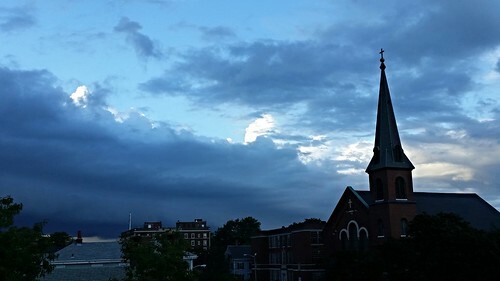 Downtown Salem as a storm makes its way in. It's that time of year where thunderstorms become a bit of the norm. Lots of humidity and heat and thunderstorms arrive almost as quickly as they disappear. I happen to be parking my car at the downtown parking lot in Salem and went to the top floor, which doesn't have a roof and got to witness the approaching storm. That wave of clouds seems so oppressive and ready to just take over. I love the eve of a storm, where one can feel the changing weather. Often this includes the rustling of wind but also a quieting that takes place and of course, a light drop in temperature--if not extreme then at least because the sun is no longer bearing down.